Been a while I know, apologies for that. Yes the Moneymore post office had been working hard delivering various parcels, it was like Christmas, only the wrapping paper wasn't too festive. Lots of nice bits to stick on my SV. These included a new front end, a lightened flywheel and some cylinder heads which Slick Bass, he of Foggy fame, had done some work on. As you can see my SV was in need of some love after my Killalane off. 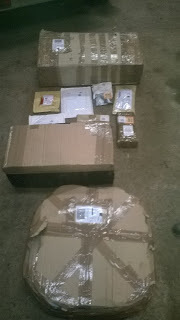 The biggest parcels were a complete front end which I bought from a guy on the SV Forum. I don't need a whole front end just the forks, but at the price it was worth taking the lot. 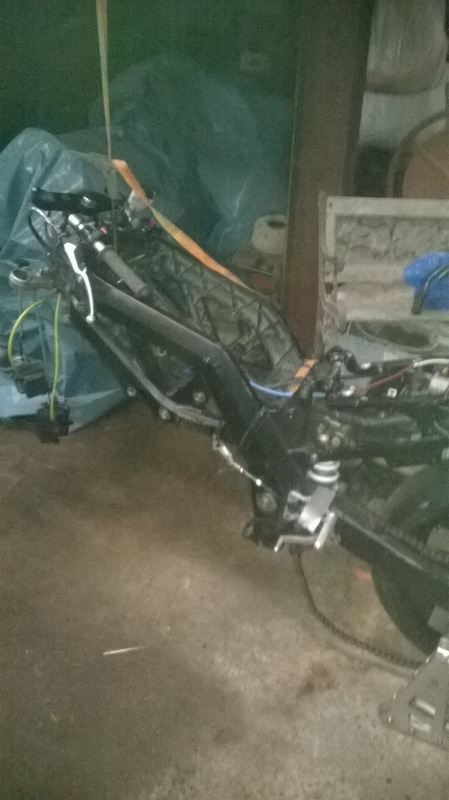 First job was to put the new forks in so I could move the bike around. With this done I set about fitting new piston rings as wasn't sure when this had last been done. All was going well until I found the rear cylinder had some surface rust due to a leaky roof in the shed. I mean what are the chances of putting the barrels under the one place the roof leaked? I've now got to see if this is still ok to use or if I have to source a new one. As time was running out over there, and my van needs an MOT, believe it or not an MOT issued in Northern Ireland is not valid in the rest of the UK, I had to bring the bike and van back home. So I now have my bike back and plenty of time to work on her, just as well as Tandragee is rapidly approaching. Am really looking forward to getting started on the engine as I find rebuilding an engine strangely therapeutic,I must get out more. 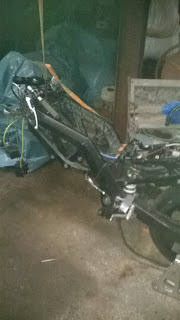 Hopefully my next update will be with the engine assembled and back in the bike. Apparently the SV is the bike to have this year, Slick has some tricks up his sleeve. Has he imparted any to you? I spoke at length at last years Southern 100 with Slick, and he has been getting some good results with his SV modifications. I've not gone for a full on tune, basically down to cost, but hopefully he has released a few more horsepower, with his magic wand/Dremel. Am looking forward to getting out on her top see the difference.